Helen E. Majhor, 94, a longtime resident of the Hillsboro community, died Friday evening, January 25, 2019 at the Providence St. Vincent Medical Center in Portland. 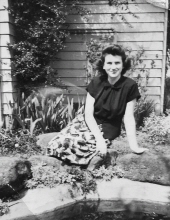 HELEN ELIZABETH MAJHOR was born July 6, 1924 in Portland, Oregon, the daughter of the late Ernest Wilfert and Lorena (Sherwood) Wilfert. She was raised and received her education in Orenco, having attended the Orenco Elementary School and then the Hillsboro Union High School, having been a graduate of the class of 1942. Upon her high school graduation, she attended the Behnke Walker Business School for two years. She was united in marriage to Robert Gilbert “Bob” Majhor on August 17, 1946 in the St. Matthew Catholic Church in Hillsboro. They celebrated their 72nd Wedding Anniversary this past August. Following their marriage they resided in several communities, including Corvallis, Oregon; Mill City, Oregon; Everett, Washington; Cedar Mill, Oregon; Elgin, Illinois; Pittsburgh, Pennsylvania; Castro Valley, California; Salt Lake City, Utah and Hayward, California, until 1973, when they returned to Oregon, settling in the Aloha community. In 1984, they moved to the Hillsboro community, where they have resided since. Helen had worked as a bookkeeper for several years for the Case Equipment Company in Portland. She had volunteered for several years at the North Plains Senior Center. She and her husband, Bob, were instrumental in building the low income housing complex in North Plains. Helen was a member of the Catholic Church, having been a member of Elizabeth Ann Seton Parish in Beaverton and St. Matthew Parish in Hillsboro. They were also members of the Rollin Roamers Travel Club. Among her special interests, she enjoyed traveling, especially touring the United States in their motor-home. She was preceded in death by her parents, Ernest and Lorena Wilfert. Paula Majhor, of Hillsboro, Oregon and her brother and sister-in-law, Sherwood and Delores Wilfert, of Hillsboro, Oregon. Also surviving are her eleven grandchildren and their spouses, Joseph Majhor; Daniel Majhor; Richard Majhor; Melissa and Gilbert DeLuna; Monica and Daniel Rushing; Jared and Kirby Majhor; Nolan and Emma Lynch; Keith Majhor; Erin Lynch; Karen Majhor and Maureen Lynch; her six great-grandchildren, Andrew, Ethan and Iliana McCreary; Ezekial DeLuna; Casey Majhor and Estella Rushing and several nieces and nephews. In lieu of flowers, the family suggests contributions be made to the North Plains Senior Center, 31450 NW Commercial St, North Plains, OR 97133, in Helen's memory. To send flowers or a remembrance gift to the family of Helen Elizabeth Majhor, please visit our Tribute Store. Family & friends are invited to attend a reception immediately following the Mass, to be held in the Fellowship Hall. "Email Address" would like to share the life celebration of Helen Elizabeth Majhor. Click on the "link" to go to share a favorite memory or leave a condolence message for the family.